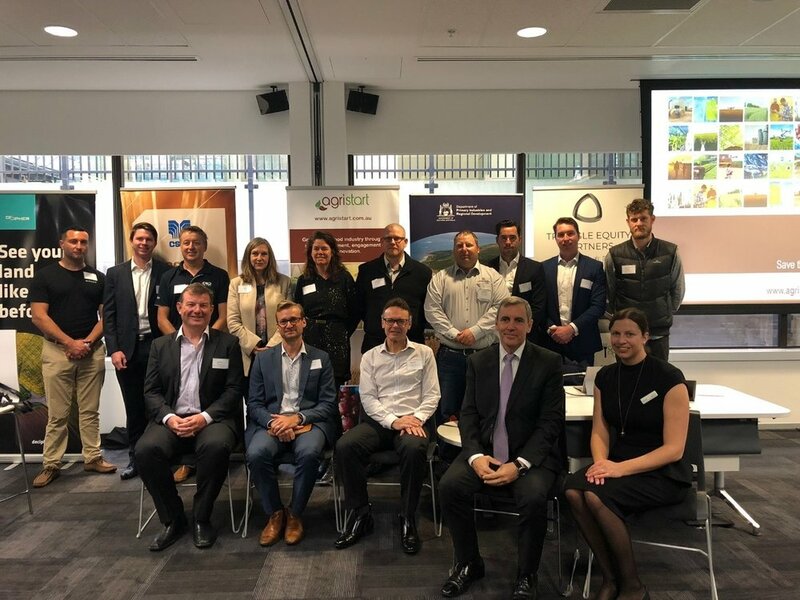 Key stakeholders in the WA agricultural, business and technology sectors met at the Paddocks to Perth: Agtech and Regional Innovation forum event yesterday to discuss key initiatives currently driving the Western Australian Agtech sector and to announce the new cohort of the HARVEST 2.0 program. Parliamentary Secretary to the Minister for Water; Fisheries; Forestry; Innovation and ICT; Science, Chris Tallentire MLA and AgriStart Directors Tash Ayers and Peter Rossdeutscher with some of the HARVEST 2.0 cohort at the program launch. The forum featured a keynote from WesCEF Innovation and Commercialisation General Manager Mussaret Nagree on Innovations in Agtech and a discussion panel including Susan Hall from Department of Primary Industries and Regional Development (DPIRD), Frank D’Emden from Decipher, Gary Rogers from Hemp Homes and Amanda Walker from the Wheatbelt Business Network. Mussaret Nagree from WesCEF discussed both the opportunities and challenges facing the Agtech industry. Offering fascinating insights into scaling large projects and initiatives, Nagree reinforced the primary importance of connecting with and understanding the farmer as a customer. “It’s really important to take time to get to know your customer, understanding what their pain points are, what’s going to make it easier for them to manage their farms and boost efficiencies and you can only get that by engaging with them directly,” she said. Panel member Frank D’Emden from Decipher offered some further insight into the customer, saying that digital technology adoption by farmers is still relatively low comparatively across sectors, however this presents invaluable opportunities and support for uptake, especially as billions of dollars is currently being invested in the Australian Agtech industry. “I foresee in less than 20 years time farmers being able to look at a map and see what every part of their farm is doing in terms of the critical components of their agronomy, forecasting out 14 days ahead with 90% accuracy of what the weather is going to do and having much better knowledge about supply,” he said. Susan Hall, Acting General Manager at DPIRD’s WA Open for Business said leveraging off partnerships like the one with AgriStart brings great results for the industry. “What we really want to do is be a part of this great culture of innovation across the ag sector and across the regions, and we do this with partnerships, like the one we have with AgriStart and the HARVEST participants” she said. AgriStart Managing Director, Tash Ayers says connection and collaboration is key to supporting and exporting WA innovation, particularly within the regions. “Regional innovation needs to be part of the city agenda too. This networking event showcased the exciting innovations already happening in regional WA and the value of connecting businesses across the state and globally,” she said. The forum culminated in the announcement of the cohort for next round of the HARVEST 2.0 Accelerator Program, where 16 highly innovative WA start-ups are given the opportunity to accelerate their business under the expert mentorship and guidance of some of Western Australia’s most successful business people. The program has been expanded to include the HARVEST Residential Intensive Program, a business accelerator for regional participants. The HARVEST2.0 Accelerator programs target late-stage start-ups and SMEs looking to scale their business, attract investment, develop new networks and partnerships or explore new export markets. Participants will be mentored by expert growth facilitators who have high level expertise in corporate innovation, entrepreneurial thinking, agriculture and research connections. The program consists of two programs: the HARVEST Agtech Accelerator Program and the HARVEST Residential Intensive Program at Muresk Institute.